Good News: After weeks, months, and years of hemming and hawing, I have finally started to put the finishing touches to my syndication package. Yes, I'll be sending Those Funky Idiots back to the syndicates soon and I guess we'll see what happens. So far I have inked six strips. I'm aiming for thirty-six. More progress soon. Shirts: It's not safe being one of my shirts. I stupidly tore one of my newest shirts today and then the cursing began. It's a small tear, but it's already ruined in my mind and I really loved that shirt! It was plaid and orange and I really looked good in it! Hopefully, I can get another one to replace it. Geography: Audrea Quinton is in San Diego. For those who don't know, Audrea was one of the talented actors featured in a little public access show near to my heart called Those Funky Idiots. Audrea played Sara Euler and The Rummage Sale Lady. She and her beau recently headed out west to find their fortune and, according to all reports, they are settling in nicely. Good luck, Audrea, and keep in touch! 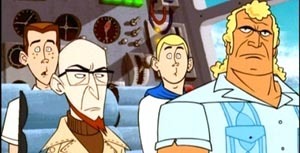 The second season of The Venture Bros. begins tonight at 10:30pm on Adult Swim. Watch it and be happy! At least, I know I will. Go Team Venture! Yesterday was my birthday and the highlight of my big day was passing the vision test for my new driver's license. Unfortunately, that also means I can clearly see the hideous picture plastered on my new license as well. Thanks to everyone who wished me a happy day! Fickle: When I first saw the early trailers for Cars, I wasn't too impressed, but now I want to go see it. Character Flaw: I'm a bit of a hypochondriac. Every twitch, tingle, and bump leads me to believe I have cancer or some other scary, serious disease. Hate: Flip-flops and that annoying sound they make. If you're going to wear a shoe, shouldn't it be a real one? "I haven't seen you since you had an Afro!" Prairie Revisited: Roger Ebert reviews APHC and makes me reconsider my thoughts concerning the film. Tom (Looking at two business cards): Hey, Mom, come look at these! Tom: Which business card do you like better? Mom (Looks at the cards): Hmmm. The one on the right. Tom: Really? I think I like the other one better. Mom (Looks again): But it looks like you smudged the ink with your thumb! Tom: Yeah, but I meant presmudge. Mom: What are those things for anyway? Tom: To promote my detective agency. Mom: Oh, are you still doing that? Tom (Making a face): Of course! I am a private investigator now, Mom. Have been for nearly two weeks! Mom: That's nice. Could you take out the garbage now? Tom (Getting up from the table and leaving the kitchen): Can't, Mom! I have a date with a copier! Mom (Sighs): At least, he's seeing someone. I just got back from seeing a sneak preview of A Prairie Home Companion (Courtesy of Indiana Public Radio) and I found it to be a slight, but enjoyable film. Chronicling the last performance of a fictionalized APHC, the movie brings together the talents of Robert Altman and Garrison Keillor and they successfully bring Keillor's world to life. In fact, part of the film's fun is to see the radio cast (Tom Keith, Sue Scott, Tim Russell) interacting with longtime Prairie Home characters (private eye Guy Noir, cowboys Dusty Lefty). However, for somebody who just fallen in love with Altman's classic Nashville, I felt a bit underwhelmed by his latest. Of course, it's not the movie's fault it isn't Nashville, that's my own hang-up. The cast was uniformly great with standouts including Woody Harrelson and John C. Reilly as the singing cowboys, Meryl Streep and Lily Tomlin as the Johnson Sisters (They played off each other very nicely), and Maya Randolph as a put-upon stagehand. Virginia Madsen is also on hand, using some of her luminous charm that she established in Sideways and Garrison Keillor plays himself like nobody else. His radio personae successfully makes the leap to screen, flaws and all. Bonus points for featuring regular Prairie Home guests Jearlyn Steele, Prudence Johnson, and Robin & Linda Williams (Thus ensuring I will buy a copy of the soundtrack). I had a fun time watching APHC, but I just wish there was more to it than there was. Fun, but not memorable. All Mobbed Up: So the last episode of The Sopranos was a bit of a let down, but I'm generally pleased with the sixth season. It'll be interesting to see how things will wrap up in the upcoming final eight episodes, but that's going to be down the road in 2007. The Sign of The Bust: Everybody successfully survive the dreaded 6/6/06? No encounters with the Auntie Christ on my end. She's such a tease. You Say It's Your Birthday: A week from now, I'll be celebrating another birthday. I know some people may want to buy me gifts in honor of my big day, but I want to put a stop to that foolishness! As I get closer to turning 37, I have decided that at my age gifts are really not necessary. No, just a simple card or an acknowledgement is all that I need so I don't want anybody to go to the trouble and the expense to buy me a gift! Really. Well, TV fans, tonight's the last episode of The Sopranos for awhile. This season went pretty fast. It just seems like yesterday when we celebrated Sopranos Sunday in honor of the first new episode and now we're at the end. It has been a pretty solid season. Change was in the air for some (Tony, Vito) and stagnant (Carmela) for others. Will Tony's "Everyday is a gift" mantra hold up in the end or continue to gradually wilt? I'm betting on the latter, of course. As someone once noted, nobody really changes on The Sopranos. We'll see if tonight's episode continues that trend.